Never let it be said that there is no drama in knitting. Fortunately, most of the drama has to do with dropped stitches and incorrect gauge. Clicking on the picture will make it bigger, use the back button to come back to this page. Now I'm learning that all did not go as planned. I've been reading a number of blogs, including one belonging to the organizer, another from a teacher, trying to get a balanced view of what happened. What I'm getting from all of this is that it was an overly-ambitious undertaking. There were problems with getting the correct stamps allowing overseas teachers to teach, classes that were cancelled, reduced or rescheduled, teachers who were not paid or not fully paid, airfare that was not reimbursed, paticipants who signed up, and paid for, classes that weren't to be, difficulties with organizers that were unavailable...and the list goes on. I feel badly for everyone who was disappointed and out of pocket, financially. I ended up withdrawing from the event and going to be with Mom during a difficult time. While I had hoped to go to Scotland to teach, in the end, family came first. I know the sick feeling that the teachers must be experiencing now. In, I think, 2003, I taught at SockFest in Toledo, Ohio and had to fight for payment and suffered the insults of the organizer who called me unprofessional when I wanted to be paid. After weeks and months I did get a check, but I'm not sure that the other teachers did. It makes me appreciate the organization that goes into events such as Stitches. I've been to Stitches West twice, in California, and had a good time both times. I've already planned to go to Stitches South in Atlanta next April. I'm looking forward to the day when the classes and events are announced and I can, confidently, sign up. If you'd like to read more observations about Knit Camp 2010 (no link - the website has been taken down), I found a few more blog posts here, here, here and here, on Ravelry here, and of course, you can Google for more if you like. The one thing that I'm taking away from all of this is that an event of this size cannot be successfully organized by just a couple of people. I have plenty of sympathy to go around to everyone who was involved or affected. I'm sure that it's going to be difficult to get overseas instructors to participate at future events. This aftermath of this will be felt for years. As one of the instructors affected by this, I can vouch for the strong and long-lasting impact of this event. Unfortunately, as the folks in my knitting group were observing last night, this will make it much more difficult for small, start-up events to take place, even if they're run by people who know what they're tackling and have the mental and physical wherewithal to succeed. I'd hate to see the only events that can occur be those that are produced and funded by organizations that have deep-enough pockets to pay all the travel costs in advance and to issue payment for teaching to instructors before they depart on the last day (although even small events should be able to manage the latter). Yet for the instructors this was not just a minor burn from a match, quickly snuffed. It was a large-scale forest fire where we wish there were the equivalent of a federal Type 1 incident response team to get it under control and stop the damage. 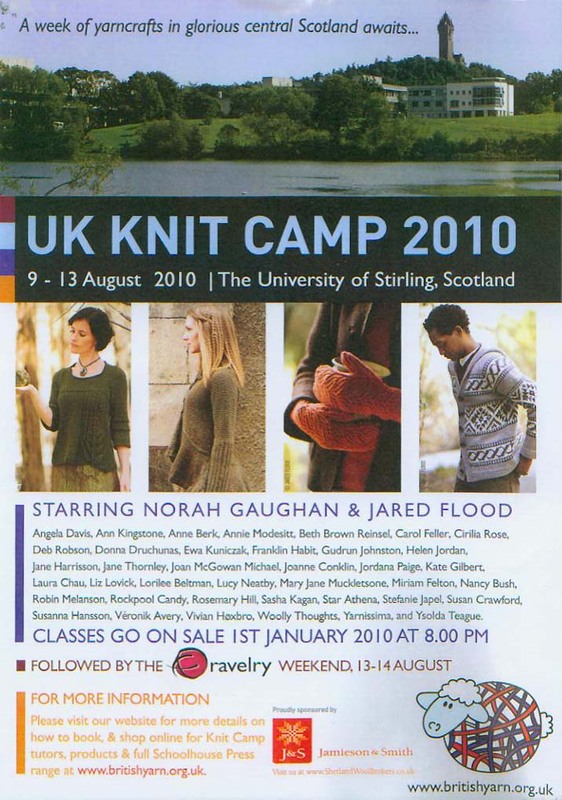 I'm working on a second blog post about UK Knit Camp. It's not easy to write up.